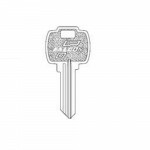 The Schlage 35-009 are Everest 6-pin Full Size Key Blanks. C123 or C145 Keyways Order in mul.. The Schlage 35-056 are Control Key Blanks, Classic keyways. C, CE, E, F, G Keyways Schlage c.. The Schlage 35-100 are Classic 5-pin Key Blanks. C, CE, E, EF, F, FG, G, H, J, L Keyways Ord.. 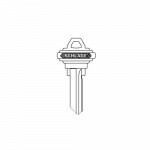 The Schlage 35-003 Control Key Blanks, Everest keyways. C123 or C145 Keyways Schlage catalog.. The Falcon KB573 is a Standard 5-Pin E & G Key Blank. Order in multiples of 50. Falcon c.. The Falcon KB577 is a Standard 6-Pin E & G Key Blank. Order in multiples of 50. Falcon c.. The Falcon KB581 is a Standard 7-Pin E & G Key Blank. Box of 50. Falcon catalog &nbs.. 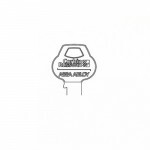 The Falcon KB628 is a Standard IC 6/7-Pin A, B, C, D, DD, E, F, H, J, K, L, M, N, Q, R Key Blank.Box..
Corbin Russwin Key Blanks – 981 Series 981, 982, 983. Must be ordered in multiples of 50, key bl..
Corbin Russwin Key Blanks – 77 Series 77, 77A1, 77A2, 77B1, 77B2. Must be ordered in multiples o..
Corbin Russwin Key Blanks – H Series H1, H2, H3, H4, H5, H6, H7, H8. (Russwin) Must be ordered i..
Corbin Russwin Key Blanks – D Series D1, D2, D3, D4. (Russwin®) Must be ordered in multiples of ..
Corbin Russwin Key Blanks – L Series L1, L2, L3, L4. (Corbin Russwin) Must be ordered in multipl..
Corbin Russwin Key Blanks – N Series N1, N2, N3, N4, N5, N6, N7, N8, N9, N10, N11, N12, N13, N14, N1..
Corbin Russwin Key Blanks – 27 Series 27, 27A1, 27A2, 27B1, 27B2. Must be ordered in multiples o..
Corbin Russwin Key Blanks – 57 Series 57A1, 57A2, 57B1, 57B2, 57C1, 57C2, 57D1, 57D2. Must be or..
Corbin Russwin Key Blanks – 59 Series 59A1, 59A2, 59B1, 59B2, 59C1, 59C2, 59D1, 59D2, 60. (Corbin®) ..
Corbin Russwin Key Blanks – 70 Series 70. (Corbin) Must be ordered in multiples of 50, key blank..
Corbin Russwin Key Blanks – 852 Series 852. Must be ordered in multiples of 50, key blanks are s..